The choice of John Cooper as the Sun Devils new head coach shocked some because he was not a “name” at the time. The Tennessee native played effectively and served as team captain at Iowa State after his years in the U.S. Army. He remained at his alma mater as an assistant and then continued up the ladder at Oregon State, UCLA, Kansas, and Kentucky. As Tulsa’s head coach, he put together a 57-31 record, five Missouri Valley Conference titles, and a penchant for big upsets. 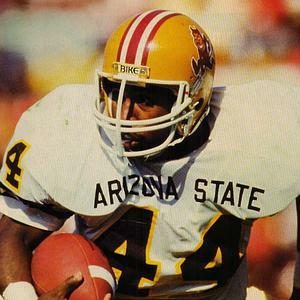 Cooper altered the helmet that had been introduced by Rogers slightly, using a “Sparky” decal that had more facial detail and close observation revealed that the pitchfork was now sunflower colored instead of maroon. With QB Jeff Van Raaphorst at the controls, Cooper surprised the nation as only the 16-13 loss to rival Arizona in the season finale kept them from their first Rose Bowl appearance. They played Arkansas tough in an 18-17 Holiday Bowl loss but Cooper would bring his team storming back in ’86. The Sun Devils went 10-1-1 with the capper being their historical 22-15 victory over Michigan in the Rose Bowl. The stars of the early Cooper teams did well in the pros with the most notable being David Fulcher who spent all but one of his eight pro seasons with the Bengals, RB Darryl Clack who played with the Cowboys, stout NG Dan Saleamua whose lengthy career is most closely associated with his success in Kansas City, and guard Randall McDaniel. Cooper would use Arizona State as a springboard to the head coaching position at Ohio State where he remained for thirteen seasons and gained entry to The College Football Hall Of Fame in 2008. The 11-0 season of 1996 brought another Rose Bowl appearance under coach Bruce Snyder. Annually, Arizona State, through the tenures of Snyder, Dirk Koetter, and most recently Dennis Erickson, are competitive with a reputation for excellent offensive performances.